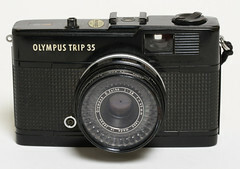 The Olympus Trip 35 is a fully-automatic 35mm compact camera, manufactured by Olympus from 1967 to 1984, during which time over ten million units were sold. 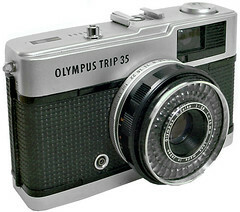 (This oft-quoted figure is likely to have included later plastic-bodied Olympus cameras with Trip branding, as the original Trip 35 had serial numbers going up to around 5,400,000.) The auto-exposure mechanism is effectively solar-powered by a selenium cell surrounding the lens, and consequently the camera runs entirely without batteries. Until June 1978, the shutter button was silver-coloured metal. After that date, all Trips had a black plastic button. The camera uses a trapped needle mechanism for setting the proper exposure. The aperture is held stopped down to f22 by a spring. When the shutter button is pressed, a bar comes up and “traps” the meter needle against a plate. Following right behind the bar is a cam which is connected to the aperture blades. This comes up until it touches the trapped meter needle. The distance the cam travels determines how far the aperture opens. The combination of aperture and shutter speed that the exposure mechanism chooses depends on the amount of light available. The precise amount of light that triggers a change of the shutter speed is not documented in the user manual, but it is believed to be around EV 13. When brightness of EV 13 or more is detected, the Trip 35 will increase the shutter speed to 1/200 sec in preference to using a smaller aperture, and use a narrower aperture as light levels increase from there, presumably to avoid the diffraction effects that affect all 35mm cameras below f/11. Below EV 13, it will use the 1/40 sec speed and widen the aperture for lower light levels. The camera will refuse to fire if there is not enough light, with a red plastic flag appearing simultaneously in the viewfinder. This mechanism makes it impossible to make the error of shooting with the lens cap in place. When the aperture is set manually (primarily for flash photography), the shutter speed is set to 1/40th of a second. However, the meter is still active even in this "manual" mode. Setting the aperture manually merely sets the widest permissible aperture, and the auto-exposure mechanism may still choose to set a smaller aperture than this if it sees fit. Other than this, the camera offers no controls for setting exposure manually, though one can easily set exposure compensation by changing the film ASA dial to a higher or lower value. 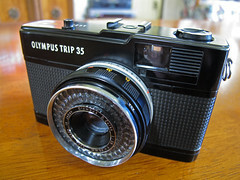 The Trip 35 has a 40mm f/2.8 Zuiko non-interchangeable lens, with four elements in three groups. Ken Rockwell suspects this to be a front-element focusing Tessar. This lens has a reputation for being extremely sharp, even in the corners; in Rockwell's tests, Costco-scanned Fuji ISO 400 print film loaded into this camera out-performed a Canon 17-40 f/4 L lens in the corners. The lens provides simple zone-focusing with 4 cute distance symbols marked on the top-left of the lens. These correspond to the real distance markings on the underside of the lens: 1 meter, 1.5 meters, 3 meters, and infinity. Filter ring is 43.5mm. The viewfinder is an albada-type, with parallax markings for closer focusing. There is a second, very small window under this, nicknamed the "Judas window", which shows the current aperture setting and distance symbol which are on the lens barrel. A small red flag will appear in the viewfinder if the auto-exposure mechanism decides there is not enough light and refuses to fire. This camera's aperture blades (there are two blades) tend to be become sticky over time. Before purchasing an old Olympus Trip 35, ask the seller if the aperture is properly opening and closing at all values (f/2.8-f/22). 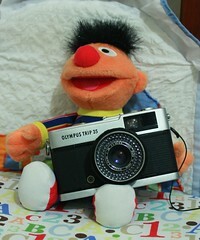 This can be done by manually selecting each aperture value and half-pressing the shutter button. Otherwise, the lens unit would have to be disassembled and cleaned. ↑ Specifications in the user-manual. ↑ 4.0 4.1 See the Trip 35 program graph, and the explanation in this thread. 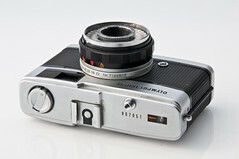 This is a trip at Classic Cameras by RaúlM. Image by Michele M. F.
This page was last edited on 22 March 2019, at 00:06.